Karma Network | Charlie Kim: "Technologies are not looking at healthcare as a whole as a holistic system." Hands up if, in 2016, you’d just bought new headphones to use with your iPhone, only to discover that Apple had ditched the 3.5 mm headphone jack for a Lightning connector. Seemingly overnight, other tech giants including Google, HTC, Huawei, and Sony also switched technologies. You not only were left with a useless old device, but also scratching your head because you got no warning. 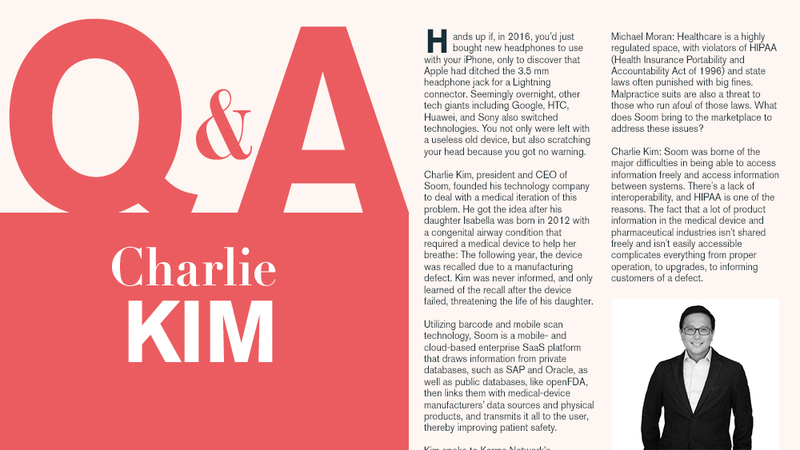 Charlie Kim, president and CEO of Soom, founded his technology company to deal with a medical iteration of this problem. He got the idea after his daughter Isabella was born in 2012 with a congenital airway condition that required a medical device to help her breathe: The following year, the device was recalled due to a manufacturing defect. Kim was never informed, and only learned of the recall after the device failed, threatening the life of his daughter. Utilizing barcode and mobile scan technology, Soom is a mobile- and cloud-based enterprise SaaS platform that draws information from private databases, such as SAP and Oracle, as well as public databases, like openFDA, then links them with medical-device manufacturers’ data sources and physical products, and transmits it all to the user, thereby improving patient safety. Kim spoke to Karma Network’s Contributing Editor Michael Moran. Michael Moran: Healthcare is a highly regulated space, with violators of HIPAA (Health Insurance Portability and Accountability Act of 1996) and state laws often punished with big fines. Malpractice suits are also a threat to those who run afoul of those laws. What does Soom bring to the marketplace to address these issues? Charlie Kim: Soom was borne of the major difficulties in being able to access information freely and access information between systems. There's a lack of interoperability, and HIPAA is one of the reasons. The fact that a lot of product information in the medical device and pharmaceutical industries isn't shared freely and isn't easily accessible complicates everything from proper operation, to upgrades, to informing customers of a defect. A few years ago, there was an EpiPen recall that caused manufacturers to lose billions of dollars in market cap overnight because they were unable to effectively communicate that their product was not safe to use. And individuals that were using them had no idea that they were not safe to use. [And in Isabella’s case,] we discovered the recall by accident. Nobody had contacted us to let us know that something was wrong with the product. Michael Moran: Wow, I’ve got two of those for bee-sting allergies, and until right now I had no idea they were recalled. I remember the price-gouging scandal, but nothing about a recall. In today's world, everything is digitized and we have a lot of data movements between large data systems run by [software] companies such as SAP SE and Oracle Corporation. All of these things are interoperable, or at least they can be, but they're not operating in that manner right now. So in essence, that’s what Soom is trying to enable. Why can't we get public information about how things work, and what manufacturers might need to correct, out to people and providers? There's nothing proprietary about knowing if a product is safe to use. There's nothing proprietary about getting instructions for use, because those instructions come with the product, and there's nothing proprietary about learning more about that product’s efficacy throughout its life. And governments around the world are actually enabling the supply chain to share that information. It's going to take innovative technology companies to really bridge the gap between all these data silos and the existing infrastructure. But the great thing is, right now I firmly believe the demand is consumer-driven, or patient-driven. We want information, insurance is becoming very expensive, and we have the right to choose. So the consumerization within healthcare is driving a lot of this, and the regulations are enabling systems to share more information. As sharing of information and interoperability start to increase, you'll get better outcomes from a healthcare perspective. You also ultimately reduce the cost of healthcare, enabling access to a broader range [of services] for a larger population. Michael Moran: You founded Soom in 2015 after the FDA created the OpenFDA portal for code and other information. You seem to originally have imagined the company as a B2B play. Have you wound up more in the consumer space than you had originally envisaged? Kim: No, I think ultimately when we talk about the patient end of it, we are focused on getting that information from where it starts: at the manufacturer. That's really where our go-to-market strategy is. Our customers are the medical-device manufacturers. We collaborate with the government, and we ultimately serve the patient and consumer. But the people who pay our bills are the medical-device manufacturers. As we start to reach into the providers, which are the hospitals and the insurance companies, they'll be paying, too. 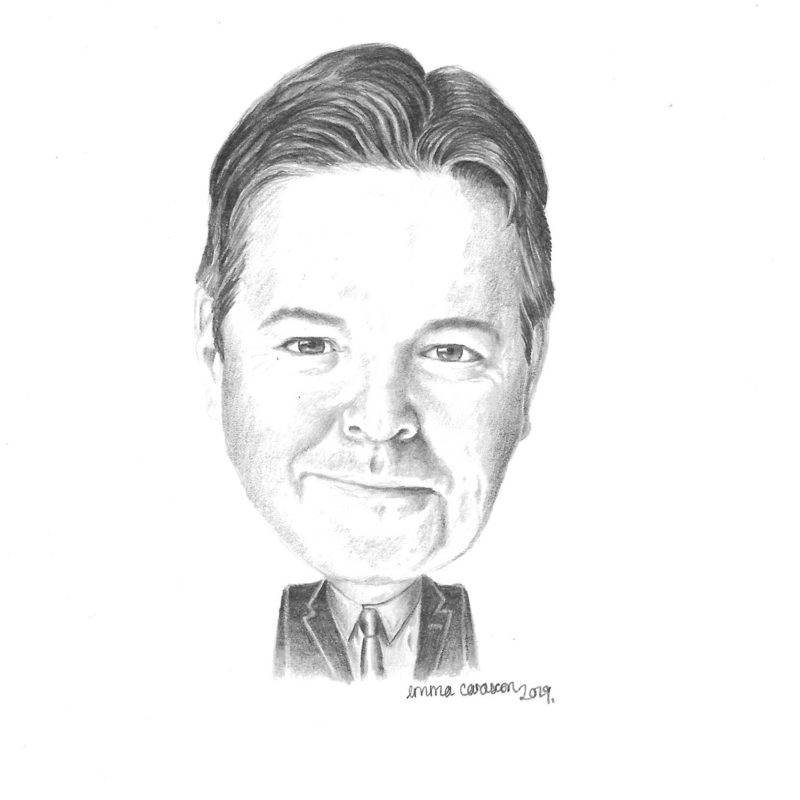 Michael Moran: What is your proposition to healthcare providers? The manufacturers clearly have a stake in this channel of information being clear and efficient, but why would a provider feel that it’s worth their risking any intermingling some highly sensitive, regulated patient information and data? Kim: We're dealing with product information. The association of that product to the individual is done on a medical- record basis, and medical records are controlled not by the hospital or the doctors. By law, they are controlled by the patients. If they dictate that they want to be able to share that information, they can. But we are not dragging any sensitive information into the scenario other than product information. What is the serial number? What is the operating system and the use of the product? What’s the batch number or lot number? Again, that’s all public information and that's what we're trying to make sure is accurately transmitted to the patient and the hospital. No doctor wants there to be any inaccuracies in that conversation. Michael Moran: We’re in an era of great sensitivity with regard to data privacy. How does that affect Soom’s business model? Kim: We don’t have a central database since our job is creating channels of communications and enabling interoperability. [The problem that] Facebook and [other] companies have with data privacy is caused by them creating centralized databases, but we are absolutely not trying to do that. When we talk about interoperability, we believe that siloed databases can [exchange and make use of information between one another, as well as] the Soom platform. We build the platform and our IP on a knowledge-graph basis. So when we're going out to government databases or manufacturer’s databases, what we are doing is targeting certain product information [in order to compare] it against the sources, so that we can give the best result back to the individual or the end user. It’s very similar to Google, which has a knowledge graph in its algorithm, and how Google Search works. The difference is we are not ranking search based upon advertising or clicks. It truly is based on what is the correct information that is being serviced. Michael Moran: Let’s talk a bit about global trade compliance, which is another promise you make for the product. Could you describe how that works? Kim: When we talk about global trade compliance, we refer to how a manufacturer in the United States can sell their product into, say, Europe. There are very specific rules governing how products must be manufactured and configured, and what kind of information or warnings need to come with it. There are certain items and data elements that are required to be both on the label, as well as within the product information packaged within an ERP [Enterprise Resource Planning] system. So what we are doing is making sure that the product that is being shipped to the end user comes with a label compliant for a region. It can be as simple as the date format. In the U.S., we do month, day, year. The E.U. generally uses day, month, year, or sometimes year, day, month. These things can cause enormous problems, and we manage that. What we do, in a two-part-check system, is make sure that the data and the information embodied in the barcode matches up with where it's supposed to go, and that the barcode itself is accurately printed on the label. Michael Moran: The data-governance business is pretty crowded and some of the giants — Microsoft, Thomson Reuters, Amazon — all have their play. How do you navigate that challenge? Kim: The reason it's crowded is because there are solutions out there that are too broad. We’re focusing on very specific, tactical problems. For example, is the label printed correctly? Are there smudges? Is it compliant for the region it’s sold in? [Because what is currently missing] is an all-encompassing solution and a platform that touches and reaches into the systems, what we're doing is tying together multiple data systems that an enterprise manufacturer would use in order to support that product and its lifecycle. Technologies are not looking at healthcare as a whole as a holistic system. They just see individual problems, and [offer] individual solutions to those. When you do that, you still have a healthcare system that is very disparate and uncoordinated. That’s not the way to remake healthcare. To bring better outcomes, the whole landscape needs to change together, and new devices cannot be out [there without having a solid purpose or foundation].